Colostrum is the first ‘whole food’ produced by all mammals for only a few hours before and after birth. Bovine (cow) colostrum is supercharged with all necessary Immune Factors and Growth Factors that are critical to the wellbeing and survival of newborn calves. And yes, even grownups need growth factors as much as children do. Albeit infants and children need growth factors to grow bigger and taller, adults do need them to help repair their DNA and RNA, as well as to prevent muscle waste which takes place as we age. Lucky for us, all the benefits of bovine colostrum are not species-specific. That is, we as humans can attain all the therapeutic qualities found in bovine colostrum by consuming it. 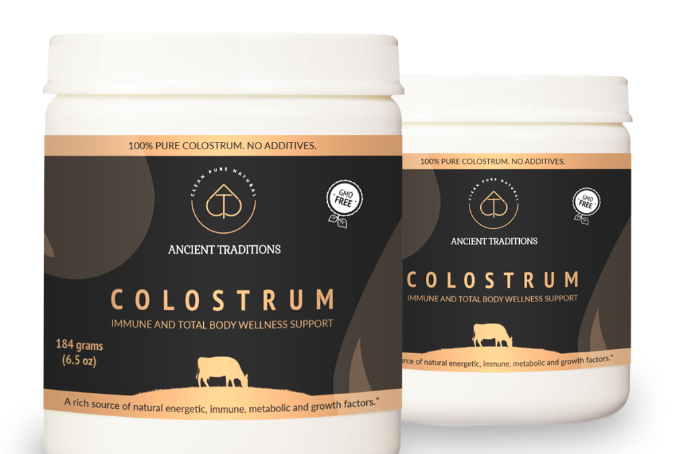 No wonder, colostrum was traditionally consumed by our ancestors and is still consumed to date in many countries around the world in the form of delicious desserts. much greater mortality rate due to their diminished immune system.
. In the United States, mainstream medical practitioners recommended colostrum as a natural antibiotic before the discovery of penicillin and sulfa drugs.
. In the 1950s, colostrum was used to treat rheumatoid arthritis. • In 1950, Dr. Albert Sabin, developer of the polio oral vaccine, discovered that bovine colostrum contains antibodies that work against polio. He recommended colostrum as a dietary supplement for children who were vulnerable to polio. • Dr. Jon Buckley of the University of South Australia pioneered much of research on colostrum, and his results led the Australian Olympic team to put the majority of its athletes on a colostrum supplementation protocol, which led to the team winning a disproportionately high number of medals for such a small country in the 2000 and 2004 Summer Olympic Games. The Australians claimed that their winning advantage was attributable to their athletes’ colostrum supplementation during training. • In 2007, a PubMed study demonstrated that supplementing bovine colostrum is three times more effective in preventing flu infection than taking a flu vaccine (1). • First-milking colostrum provides immunoglobulins (A, D, E, G and M). Immunoglobulin G (IgG) neutralizes toxins and microbes in the lymph and circulatory systems, IgM helps destroy bacteria, while IgE and IgD are highly antiviral. • Colostrum is rich in proline-rich polypeptides (PRPs), which are short chain amino acids. PRPs help activate the thymus gland that plays an important role in the immune function; through this activation PRPs can help stimulate an underactive immune system to fight off infections and simultaneously, calm down an overactive immune system, which may result in autoimmune disease such as fibromyalgia, colitis and rheumatoid arthritis. PRPs were found to have the ability to stimulate the activity of our Natural Killer cells (NK) up to 10 times more than any other known nutrient. NK cells are the cells which attack and kill pathogens and cancerous cells (2). Studies show that PRPs may provide immunity to several viruses, including herpes viruses, Epstein-Barr virus, HIV and measles (3), as well as improve neuro-degenerative conditions such as Alzheimer's disease (4). Insulin-like Growth Factor-1 (IGF-1), the natural growth hormone, which promotes muscle growth and favors fat stores over glucose as a fuel source. IGF-1 also stimulates the production of collagen, thus giving colostrum its potent anti-aging benefits. And Transforming Growth Factor (TGF-alpha and TGF-beta), which stimulates production and repair of DNA and RNA.
. Lactoferrin is another colostrum constituent, which is an antiviral, anti-bacterial and anti- inflammatory protein with great potential therapeutic effects in cancer disease prevention and/or treatment (5). Lactoferrin helps deprive bacteria of the iron they require to reproduce through its ability to bind with iron then releasing it into the red blood cells to enhance the oxygenation of tissues. • Supercharged with 97 Immune Factors and 87 Growth Factors. • Contains all the essential amino acids and fatty acids.
. Harvested from grass-fed USDA Grade A cows raised in the United States, only after the newborn calves get their share. • Third-party verified to be true 6-hour bovine colostrum by Dr. Don Lein, Professor Emeritus Cornell University and certified by independent labs. Colostrum's active elements such as immune factors, growth factors, antioxidants and anti-inflammatory agents are at their highest concentrations during the first six to eight hours after birth. However, in less than 12 hours, the concentration of these components is only half of what it was at the time of birth.
. Free of synthetic hormones, gluten and GMOs. • Never de-fatted. Research shows that almost 30% of the IGF-1 in colostrum is found in fat. • Cold-processed at under 115 Degrees Fahrenheit to maintain its bioactive properties and nutrients.
. 100% pure colostrum, no additives.
. Contains no transitional milk.
. Manufactured in a GMP certified facility. Related Posts: 5 Ways Colostrum Can Boost Your Health!